April 26, 2010 - Pilots of Piedmont Airlines, represented by the Air Line Pilots Association, Int’l (ALPA), announced that they have applied for mediation from the National Mediation Board (NMB), the government entity that oversees airline labor relations. This application comes after 11 months of contract talks with the company, resulting in only two contract sections being agreed upon and continuous stalling from management. The National Mediation Board is expected to assign a mediator who will assist in moving the two sides toward an agreement. During negotiating sessions, management has routinely responded to proposals from the pilots union with a terse “current book or less”—indicating that the company will only agree to the current language in the contract or concessions from the pilot group. Management has also resisted attempts from the union to schedule additional negotiating sessions, only offering two days a month over the next five. Founded in 1931, ALPA is the world’s largest pilot union and represents 53,000 pilots at 38 airlines in the United States and Canada, including more than 470 pilots at Piedmont Airlines. 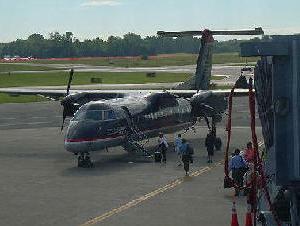 Piedmont Airlines is an American regional airline operating for US Airways Express. It is a wholly owned subsidiary of the US Airways Group. Headquartered in unincorporated Wicomico County, Maryland, near the city of Salisbury, it conducts flight operations using De Havilland Canada Dash 8 aircraft along the East Coast of the United States. Its main base is Wicomico Regional Airport, Salisbury, with hubs at Philadelphia International Airport, Charlotte/Douglas International Airport.